Mermen are mythical male legendary creatures who are human male from the waist up and fish-like from the waist down. They are less commonly known than their female counterparts, mermaids. 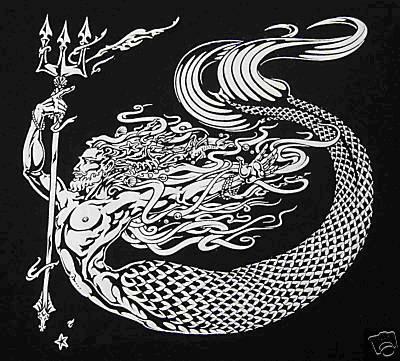 In Greek mythology, mermen were often illustrated to have green seaweed-like hair, a beard, and a trident. In Irish mythology, mermen are described as extremely ugly creatures with pointed green teeth, pig-like eyes, green hair, and a red nose. In Finnish mythology, a merman (vetehinen) is often portrayed as a magical, powerful, handsome, bearded man with the tail of a fish. He can cure illnesses, liftcurses and brew potions, but he can also cause unintended harm by becoming too curious about human life. The boto of the Amazon River regions is described according to local lore as taking the form of a human or merman, also known as encantado ("enchanted one" in Portuguese) and with the habit of seducing human women and impregnating them. Chinese mermen were believed to only surface during storms or, in some cases, were believed to have the ability cause storms. Much like sirens, mermen would sometimes sing to people and gods and enchant them, distracting them from their work and causing them to walk off the deck or run their ships aground. Other stories have them squeezing the life out of drowning men while attempting to rescue them. They are also said to take humans down to their underwater kingdoms. The actions and behavior of mermen can vary wildly depending on the source and time period of the stories. They have been said to sink ships by summoning great storms, but also said to be wise teachers, according to earlier mythology. A merman, like a mermaid, attracts humans with singing and tones. The most well-known merman was probably Triton, son of Poseidon and Amphitrite. Although Amphitrite gave birth to a merman, neither Poseidon nor Amphitrite were merfolk, although both were able to live under water as easily as on land. Triton was also known as theTrumpeter of the Sea for his usage of a conch shell. Other noteworthy mermen were the Babylonian Oannes and Ea, and the Sumerian Enki. Another notable merman from Greek mythology was Glaucus. He was born a human and lived his early life as a fisherman. One day, while fishing, he saw that the fish he caught would jump from the grass and into the sea. He ate some of the grass, believing it to have magical properties, and felt an overwhelming desire to be in the sea. He jumped in the ocean and refused to go back on land. The sea gods nearby heard his prayers and transformed him into a sea god. Ovid describes the transformation of Glaucus in theMetamorphoses, describing him as a blue-green man with a fishy member where his legs had been. Norse mythology, in particular Icelandic folklore, has mermen known as Marbendlar. In Dogon mythology (not to be confused with the semitic fish god Dagon), ancestral spirits called Nommo had humanoid upper torsos, legs and feet, and a fish-like lower torso and tail.